In the 1970s beauty contests were targeted by the women's liberation movement. Feminists viewed beauty contests as degrading and sexist because they were primarily based on a woman's looks and body shape. 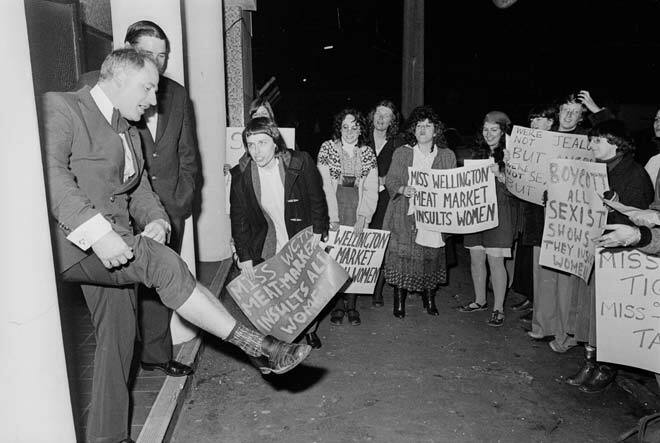 Describing beauty contests as meat markets was a common metaphor employed by protesters, including this group who gathered outside the cabaret hosting the Miss Wellington contest in 1979. Contest organiser Tom McDonald is rather cheekily showing a leg in response.